The one video game I got for Christmas this year was Persona Q: Shadow the Labyrinth. I waited until Christmas for it for several reasons—my parents needed something to get me, and because I wouldn’t’ve had time to tackle it until after the holiday anyway. So, while some people have been playing this game for months and probably cleared it several times now, I’m just starting. I consider Persona 4 to be one of my favorite video games of all time, either second or maybe even first. It just resonated with me so much when I first played it—it hit me like few other games ever did. Since its release, Atlus has milked the franchise quite a bit, but despite that, I still get excited whenever a new Persona game comes out. I think this has to do with the respect given the franchise by Atlus—the games themselves are always high quality, even if they aren’t my cup of tea (I wish I could enjoy Arena more). When I heard about Persona Q, an RPG that crossed the characters of Persona 3 and Persona 4 together, I really couldn’t wait to sink my teeth into it. Knowing that it would be a meaty RPG that required a lot of time, I waited until I was on vacation from work to really dive in. And while I’m nowhere near as far as I would like, I find the game almost impossible to set down. I just wanna hold it! 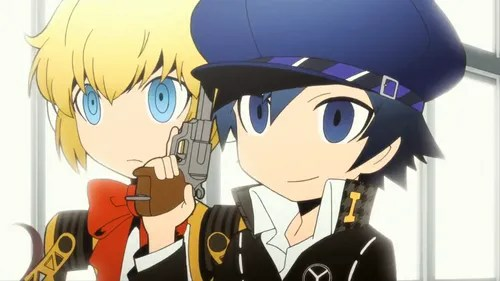 If, like one of my coworkers, you’ve played Persona 4 but have no idea what Persona Q is, it’s a game that takes the casts of Persona 3 and Persona 4 and throws them into an RPG together. The plot is that a rift has opened in space time, bringing the two universes together, despite the fact that they exist in two different times. The characters find themselves trapped in a strange version of Yasogami High’s Culture Festival, with all activities in full swing. The hallways are packed with students who seem more like lifeless drones, but all events are still running. Seems fun, but there are huge labyrinths that spring up in the school, themed around culture festival exhibits. Clearing these labyrinths seems to be the key to escaping this strange world, and the two groups of Peronsa-users come together to escape. And enjoy the culture festival while they try. It’s a strange, somewhat contrived set-up, but it works very well for what it does. The game even delves a bit into its lore, establishing that the new gameplay mechanics are in place because there are two Persona-users with the wild-card arcana in the same vicinity. It makes about as much sense as past Persona games, and I’m very willing to go along for the ride. The game adopts an adorable Chibi art style for its characters, which I love. They are so cute. :) But the Chibi-ness seems to be reflected in the characters’ personalities as well. They all feel like themselves, but slightly exaggerated versions. Teddie flirts a bit more often than before, Yosuke makes a lot of jokes at Kanji’s expense, Aigis knows nothing about the world, Chie loves meat, and so on. These are quirks of the characters in past games, but here they move more to the forefront, where the goal of the story seems to be more fun and humor rather than serious storytelling. That’s not to say there isn’t some serious moments, but the goal is more comedy than drama. That’s a lot of ice cream. The gameplay, however, is just as serious as its always been. However, many changes have been made, both subtle and obvious. For one thing, the dungeons are not randomly generated any more. Instead, you explore a first-person view of the “labyrinth,” a pre-designed dungeon with traps to navigate. You have to draw your own map on the second screen to keep track of everything, so you don’t get lost (as it is very easy to do so). This leads to more involved dungeon-navigation than in past Persona games had, as most dungeons were really just rooms where battles could occur. Here, you have to avoid powerful monsters (Called FOEs) dodge traps, solve puzzles, and so on. Considering there isn’t the high school stuff and social links to deal with now, it’s a good thing the dungeoning is more compelling. Battles have gotten a shake-up as well. Instead of having just four party members like in past games, you have five here. Battles are turn-based, but you enter all of your moves at the start of the turn, like in Persona 2, and then watch them play out without your input. It gives the game a different kind of strategy than Persona 3 and 4, and makes this game feel more unique because of it. You’re still finding and hitting enemy weaknesses, but instead of the “1-more” system, you get Boost status when you hit one. Boost status means that actions taken on your next turn in battle do not cost anything, where it be SP or HP. This is good, since the cost of spells have gone through the roof! But, by careful use of Boosts, you can get through some battles without any loss of SP. There is also the use of sub-personas. You can equip every character in your party with one subpersona, which adds their skills to the character’s own. The also had regenerating health and SP, which is a big help when fighting monsters. It allows for a lot of interesting combinations too, such as Mitsuru using fire spells, or Naoto using more than instant-kills. The sub-persona system is very necessary too, since every character in the game has become more specialized. Yukiko was my healer in Persona 4, for example, but here she only learns fire-spells and healing spells for one person. Yukari is lucky enough to get Media, but as such, does not learn AOE spells such as Magaru. It makes every character unique, and considering there are 16 different party members, they needed these distinctions to stand out. I’m not even close to finished with the game either, at 22 hours in. This game is massive. But it has a great flow, and you always feel like you are making progress. You never feel you are wasting time, as you are constantly expanding your map, finding new treasure, completing a request, or otherwise just moving forward. The game constantly pushes you to keep going, and I plan to do just that. See you in the labyrinth!